When you listen to music, it belongs to you & your friends. We want to make sure you feel that way about every song. Switching aux cords, settling for lackluster playlists, or attempting to plan a playlist in advance doesn't let that happen. Through MusicShift, we make sure that the best playlist is also the most spontaneous. MusicShift is a plug-and-play, ever-evolving collaborative playlist in a box. Just plug in an aux cord, share a QR code with your friends, and let the best music start playing. MusicShift lets you collaborate on your playlists. You can add songs to your playlist, and even upvote songs that others have added so the more popular songs are played sooner. There is no limit to the songs you can search, and no limit to the number of people who can collaborate on a single playlist through real time multi-user sync. Playlists can have different purposes too. 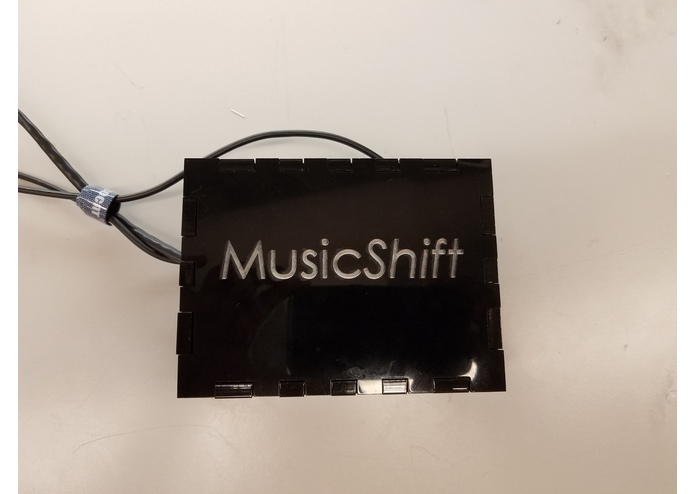 MusicShift is fun enough to be the music player during a carpool, and sophisticated enough to supply the music in public parks and restaurants. There's no need to worry about how your party's playlist fares when everyone is working together to pick the music. MusicShift is made up of three parts: a hardware device, a progressive web app, and a database backend. The hardware device is a Raspberry Pi 2 which polls the backend (MongoDB database of tracks & votes used to generate rankings / play order) for the next Spotify song to play. Using Spotify’s Python bindings & taking advantage of its predictable caching locations, we intercept the downloaded streams and live route them to the aux output. 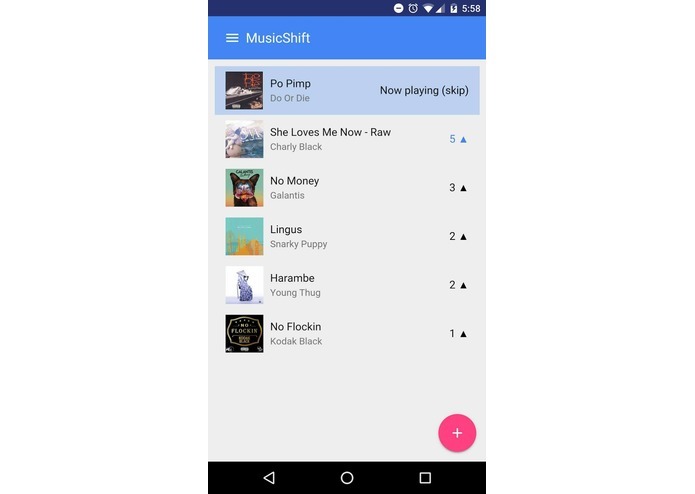 Meanwhile, our progressive web app built using Polymer offers a live view into the playlist - what’s playing, what’s next, the ability to upvote/downvote songs to have them play sooner or later, and of course skip functionality (optional, configurable by the playlist creator). It loads instantly on users’ devices and presents itself as a like-native app (addable to the user lockscreen). I worked with the hardware and Raspberry Pi scripts on this hack. I created the MusicShift Box, worked on the PYNQ and Pi machines, and composed the backbone for the scripts run. 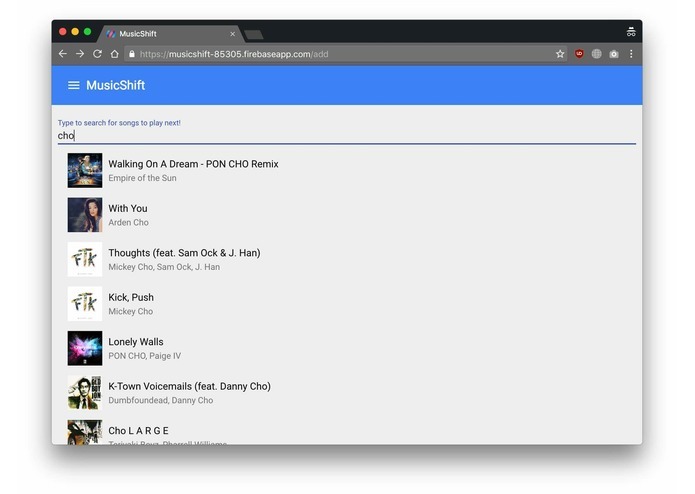 I focused on the progressive web app which users use to interact with MusicShift and build their playlist, as well as the backend which links the web app and the hardware box. We implemented the entire web app in Google Polymer, which was new to everyone on the team - but still worked out well! For the backend, we used MongoDB as our primary data store (keeping track of requested tracks as well as user voting / track ranking). I primarily worked on the hardware side of the hack. Initially we were using a PYNQ board as our microcontroller but after trying a lot of different python libraries we realised that the PYNQ board can only play audio in a 'pdm' format, which Spotify did not offer and neither could local libraries create a pdm stream. To solve this we switched to Raspberry Pi 2. I wrote python scripts to make the Raspberry Pi pull data from out progressive web app and request Spotify for music streams. I insured that the scripts started whenever the Raspberry Pi booted up to give the users a seamless experience without a setup. Learned Polymer within a few days and helped create the front-end user interface. Created my first Progressive Web App.